Hi there, I am a new Mommy to a pair of beautiful platinum sugs. The lady I got them from says they cannot see in the daylight or when I use regular light bulbs. She said they can only see in the night or when red or blue light bulbs are used. I think they can see in the day light and by the use of regular light bulbs. So, can they see in day light and with the use of regular light bulbs? Yes they can see just fine in day light or if you have the lights on in a room. They do prefer to stay in their sleeping pouch when the sun is up during the day time, which is normal for nocturnal animals. 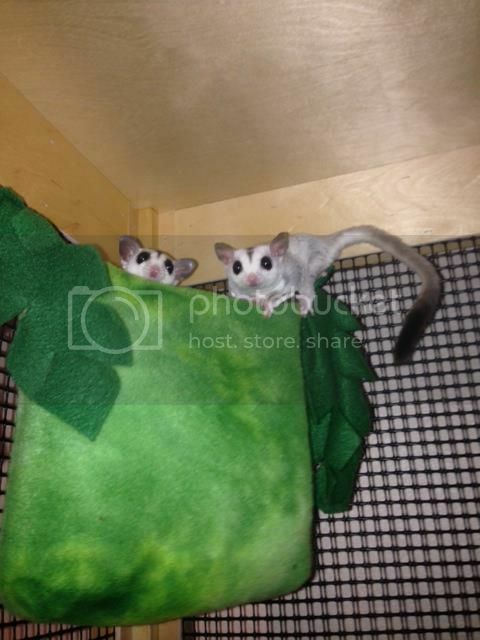 They may also choose to stay in their pouch if you leave lights on in the room where the cage is located until you have turned the lights off. As small prey animals, they are naturally active at night because it makes them more difficult for predators to see - not because they can only see at night. Great, I do let them sleep in the day because I know they are nocturnal. At night, I take them into a pet tent to play and bond with them, but I have my lamp on. It does not seem to bother them. I was just making sure. Thanks for responding to me.